This is my first scratch SIB build. I built the Hannah SIB from the Amati kit last year, and since then have acquired and read a number of the SIB books that are out there. The Amati kit was a good introduction, but I felt there were too many limitations with the heavy use of photo-etched parts. So, rather than do another kit, I thought I would take the plunge and scratch my next build, especially after getting inspired by people like Daniel and Igor and the many other great modelers on here. 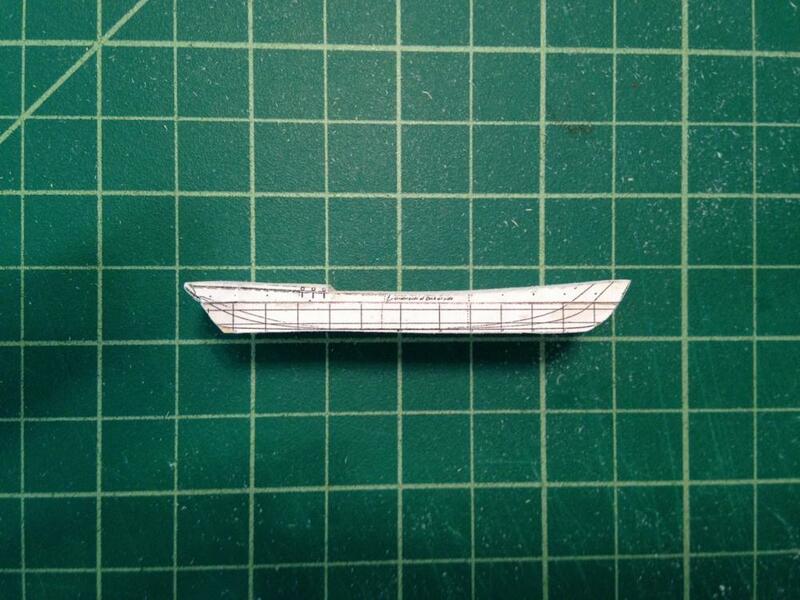 The hull is made from basswood, with the bulkheads made from 0.4mm plywood that I feathered into the hull. 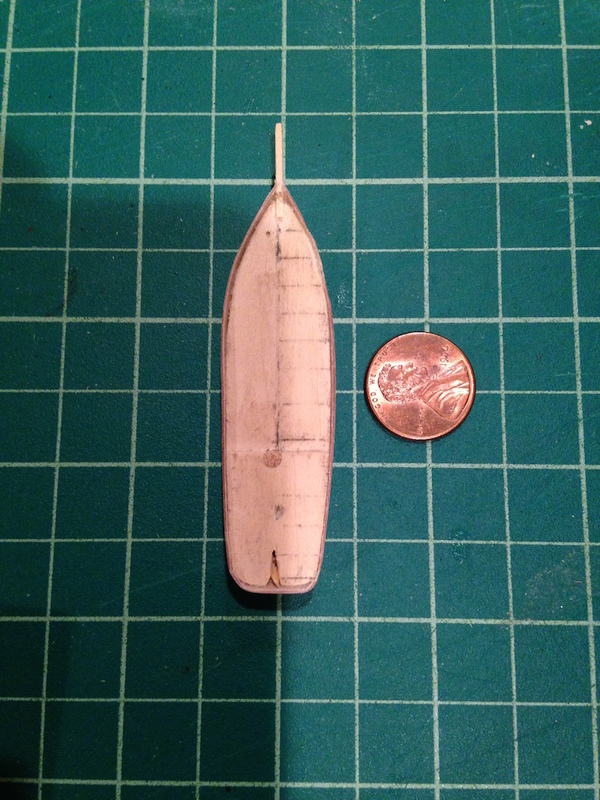 I have never been very good at painting, so I decided to split the hull along the waterline. 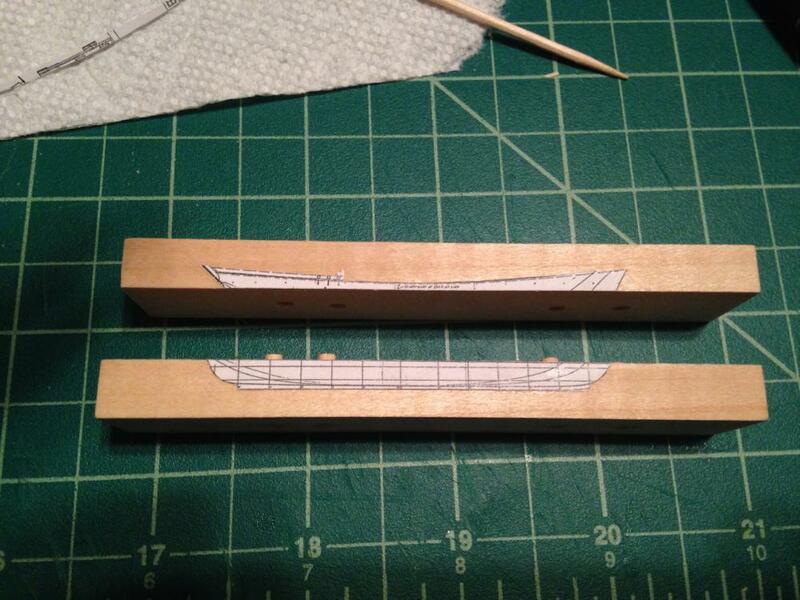 I also added a cutwater and rudder. Looking forward to your endeavour Mike! I'm not a big fan of paints, which I think are too heavy, so I am using stains on this build. The white for the upper hull is General Finishes "Whitewash" and the green on the lower hull is Minwax Express Color "Emerald." For the deck, I ended up taking a piece of maple that I sanded down to about 0.2mm in thickness. 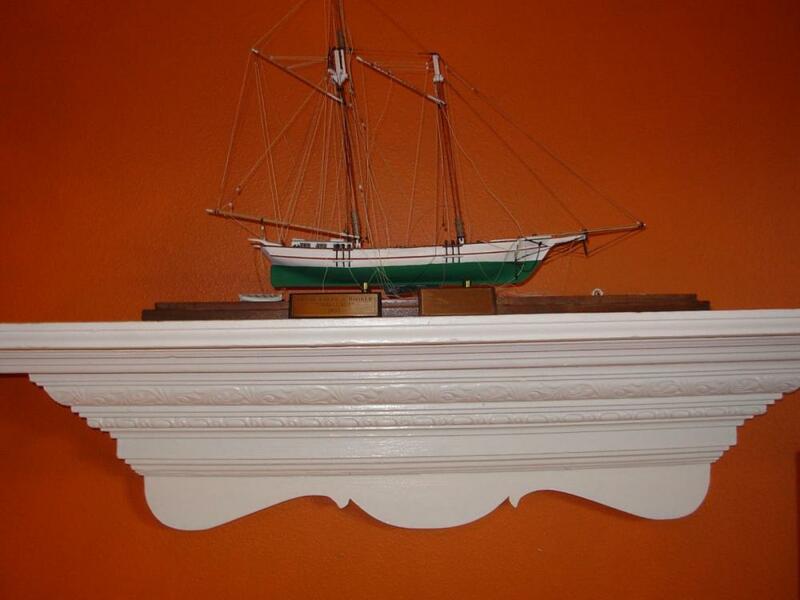 I stained it darker with General Finishes "Colonial Pine." To make the caulking, I applied Gesso, then used a blade to scribe the lines, which I then stained and wiped with General Finishes "Antique Oak." 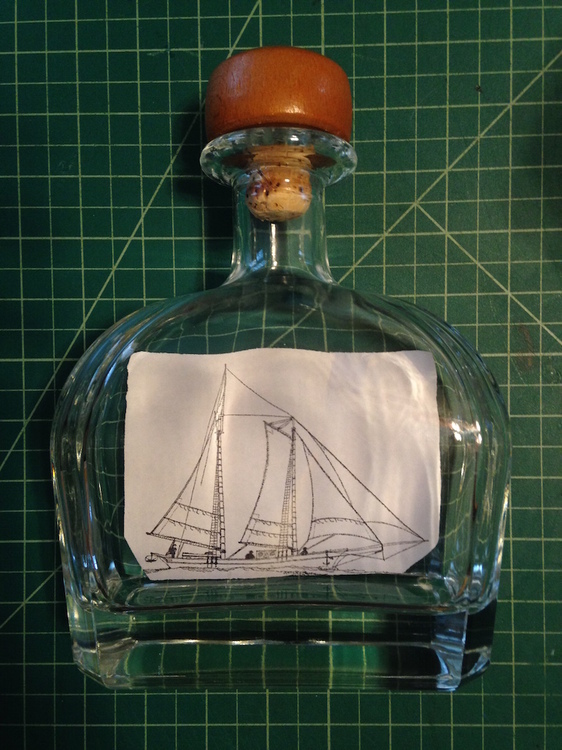 I took a look at the various bottles I have been collecting, and it looks like the ship would fit perfectly in this tequila bottle. The problem is that there isn't going to be much room to maneuver the ship around in the bottle after insertion if I use the hinged-mast method given how long the bowsprit and main mast are. 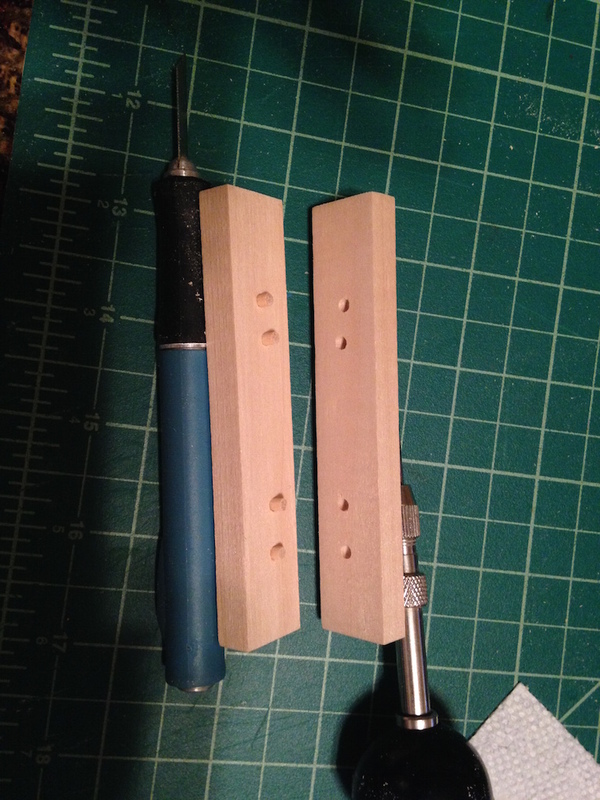 I wasn't planning on using the hinge method so that helps at least - i just need to figure out how to get it done. I've seen the dimple and draw string method, but if the bottle is upright, that makes things a little more complicated. The Challenge is really very pretty! Nice work so far, too! Definitely go with the second bottle. 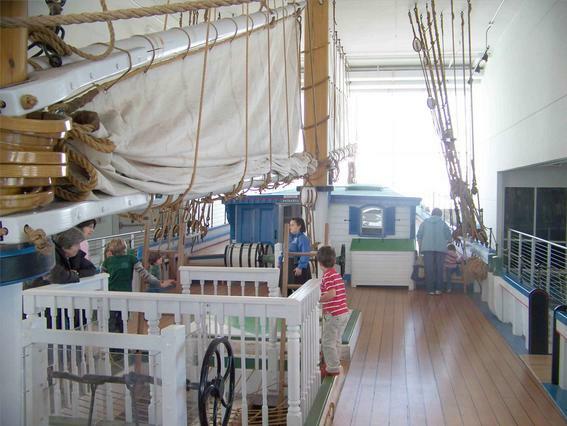 Consider hinges at the masts but instead of having the control lines through the bowsprit, secure them at the bowsprit and have them go through the two masts making the raising of the masts very simple. 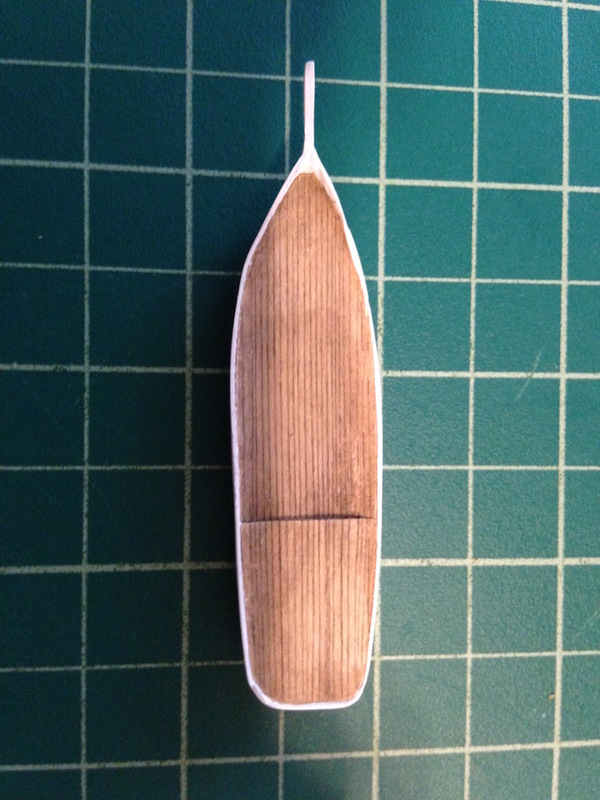 A bow first entry into the bottle will also simplify the process somewhat allowing you to start raising the masts as soon as the hull clears the neck..
Nice work so far and I look forward to seeing the progress as you proceed. Dave, I'm having a little trouble following you. 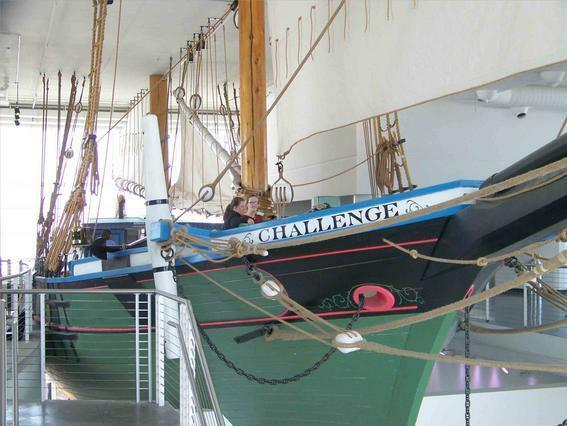 Do you mean secure the ends of the line to the bowsprit and run them to the tops of the masts? Would that mean that the masts should fold forward rather than backward? 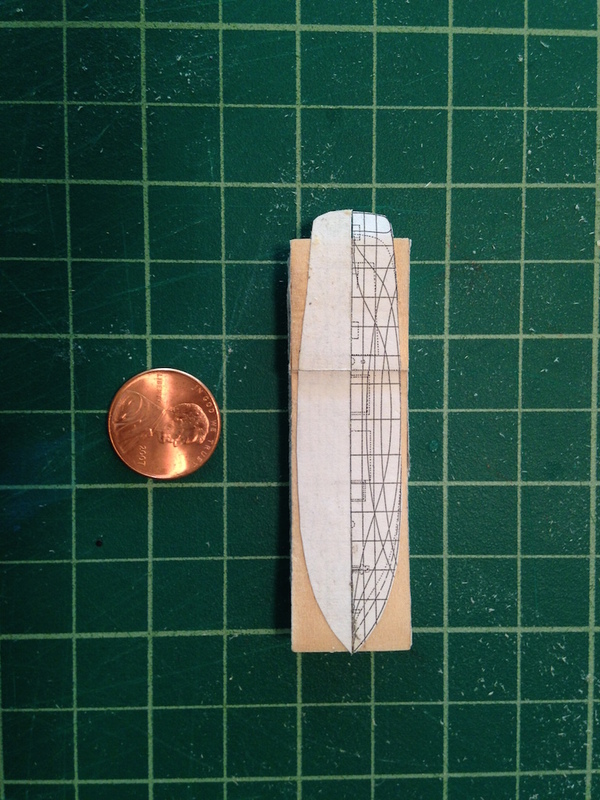 The reason I ask is that I cut a piece of bamboo skewer the length of the masts folded back towards the stern, and the model would be too long to get into the bottle and flip it 90 degrees. Also, I was curious what you guys would recommend on the standing rigging/shrouds/ratlines. 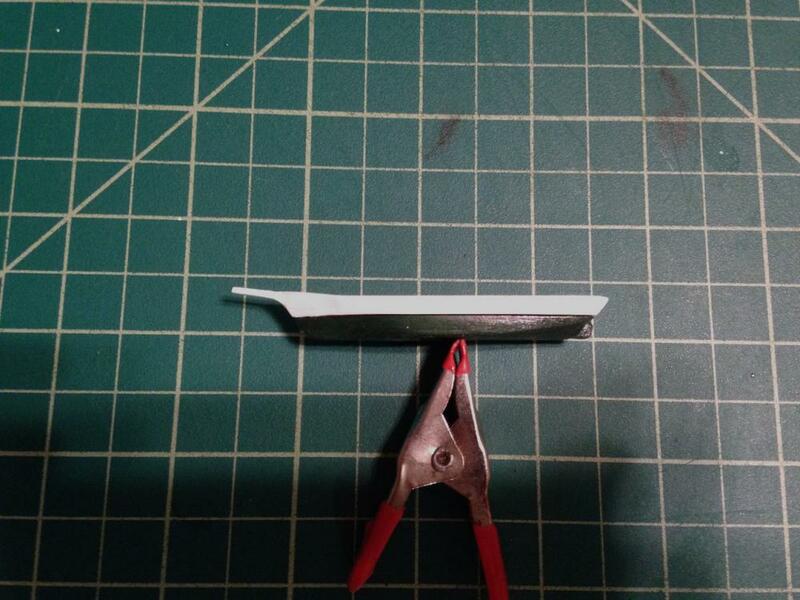 What does one do to keep them taut yet long enough so that they don't restrict the masts when they are folded down, either using the hinge method or the dimple method? That's one question that's been bugging me for a while and I'm sure there is a simple and easy approach. 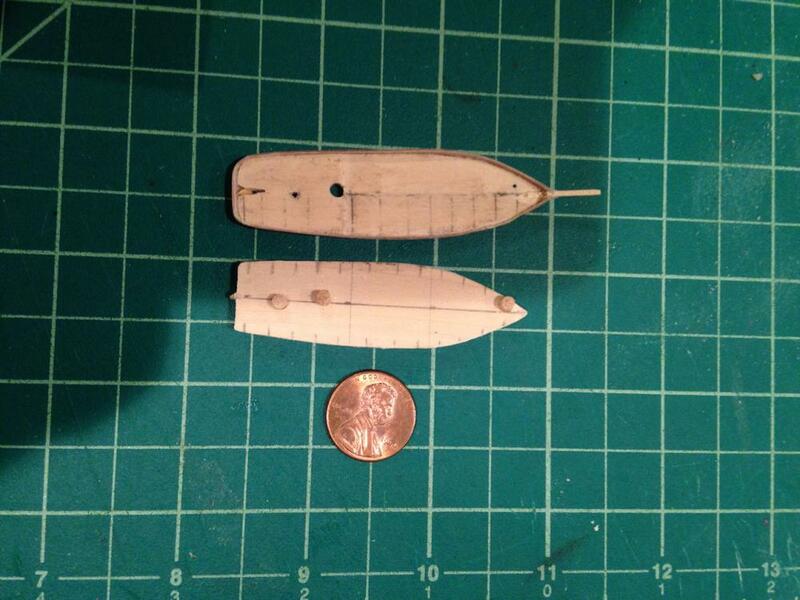 The shrouds attach to the hull at and behind the mast deck insertion/ hinge so you rig them permanently to the hull. 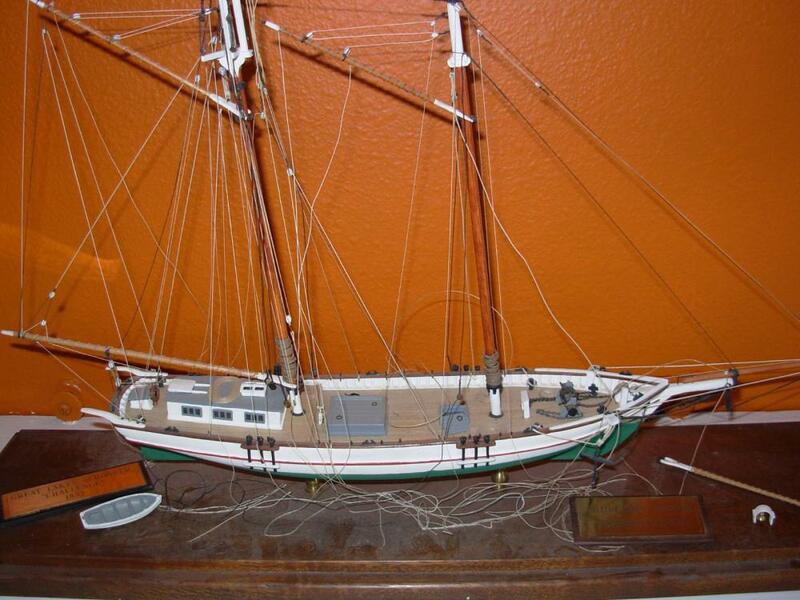 They will go slack when masts folded rearward. Is that what you are asking? Mike, to clarify, in conventional hinged masts the stays from the foremast go through holes through the bowsprit and out the bottle to be secured and cut off after the mast is erected. I suggested securing them at the bowsprit and go through holes in the masts and out the bottle to be secured after the mast is erected. On this model secure the fore stay at the bowsprit, through a hole in the foremast and left long to go out the bottle. 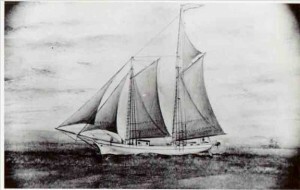 This is the inner stay, closest to the mast. The jib stay (outer line) secured at the bowsprit, through a hole in the foremast then through a hole in the mainmast and out the bottle. With the main stay (it's a horizontal line from mast to mast in your sketch just above the foresail gaff and gaff halyard) secure it to the foremast through a hole in the mainmast and out the bottle. The bow first insertion into the bottle will help. As soon as the stern clears the neck start rotating the hull while keeping the masts near vertical. 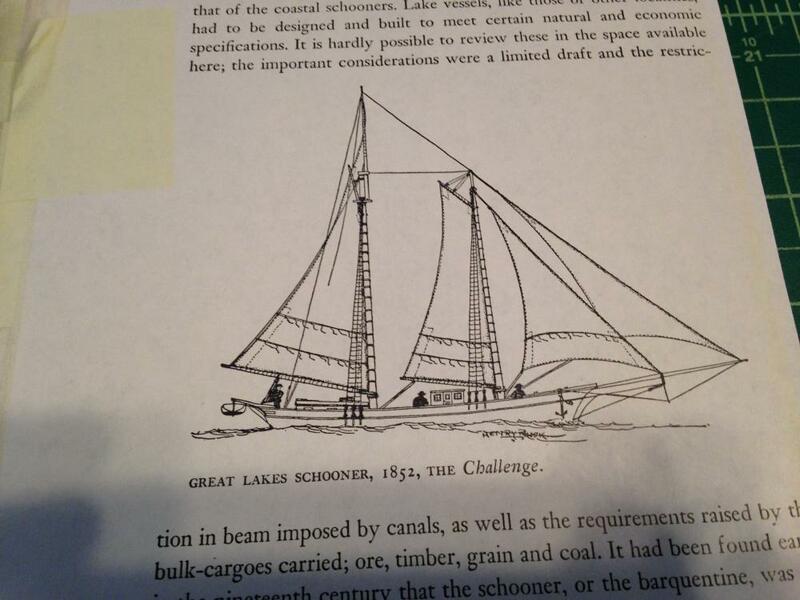 Try this with your simplified mock up using a pair of back stays (one each side) at each mast and the stays as I've described above, just a hull with bare poles and minimal rigging to work out the geometry and manipulation. I'm sure doing this will help a lot. Remember. 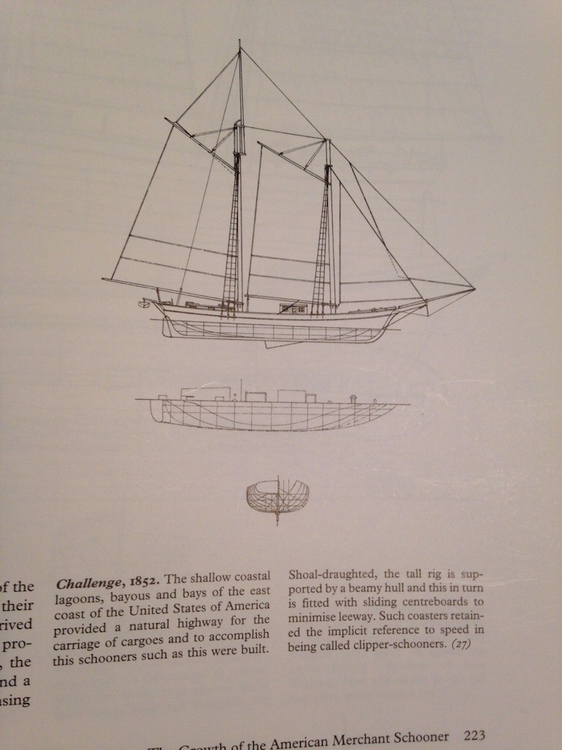 I'm talking about hinged masts. I suggest hinges rather than the guided divot method because the guide lines have to go through the bottom of the hull and complicates the mast raising. Thanks Dave, that all makes a lot of sense. I really appreciate it! Mike your off to a great start. I agree with Dave try the hinge method first. Don't be afraid to try mock sibs to with the general pieces in place. As Dave said a simple hull with bare poles and rigging. 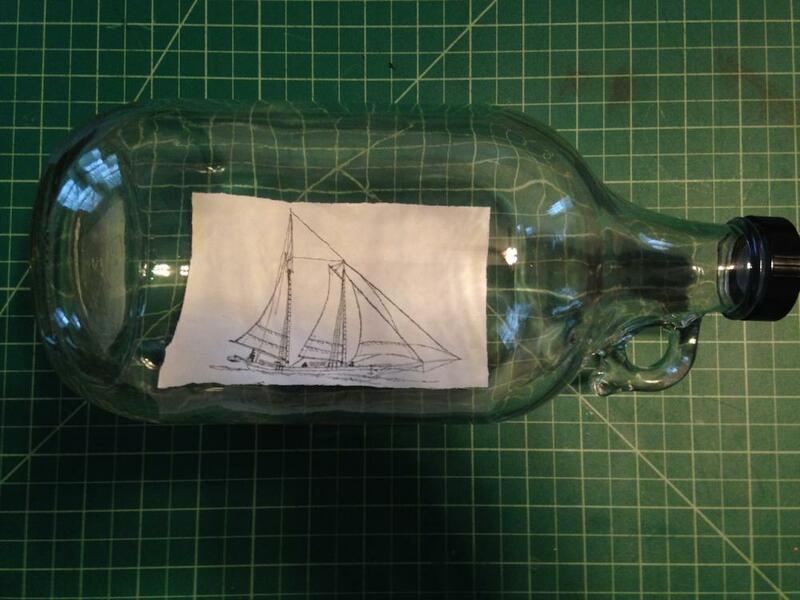 I've put a few things in plastic bottles to test ideas. One of the few things plastic bottles are good for. 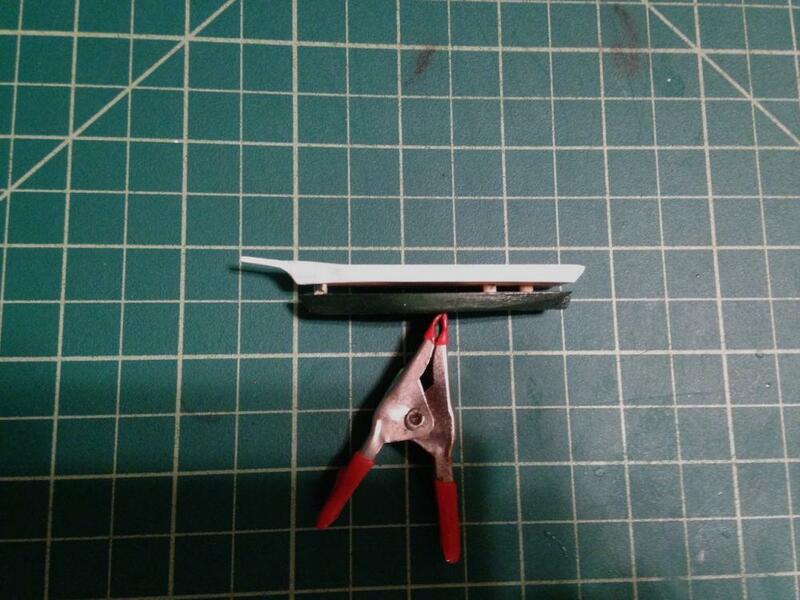 A lot of scratch building is experimentation. Your well on your way to figuring it out though. Made a little more progress yesterday in attaching the red stripe. I thought about using thread, but decided to go with some redheart wood instead which I'm using on some of my other builds. 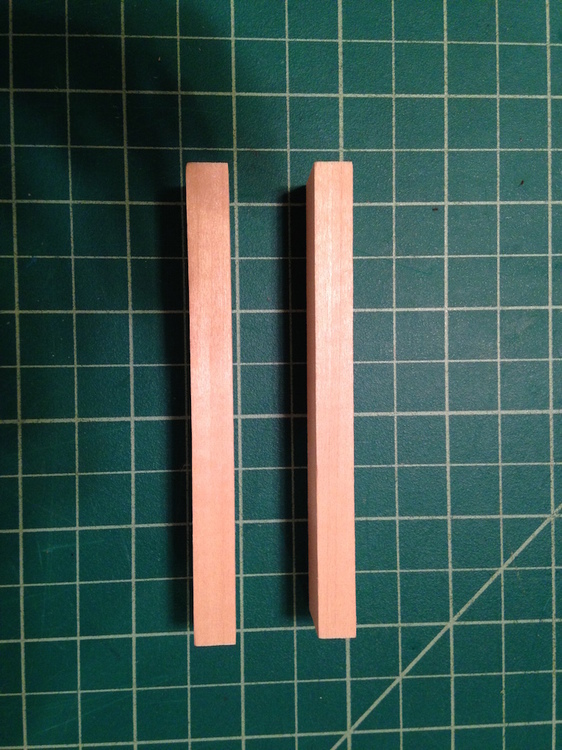 Took quite a while - I shaved off the thinnest sliver I could off my Byrnes table saw, then used a combination of razor blades, x-acto knives and sandpaper to get the end product. Redheart is a fairly strong wood, but when you are working with pieces at 0.15mm in thickness, it's hard to get a 70mm length without it splitting. All in all it came out fairly well. 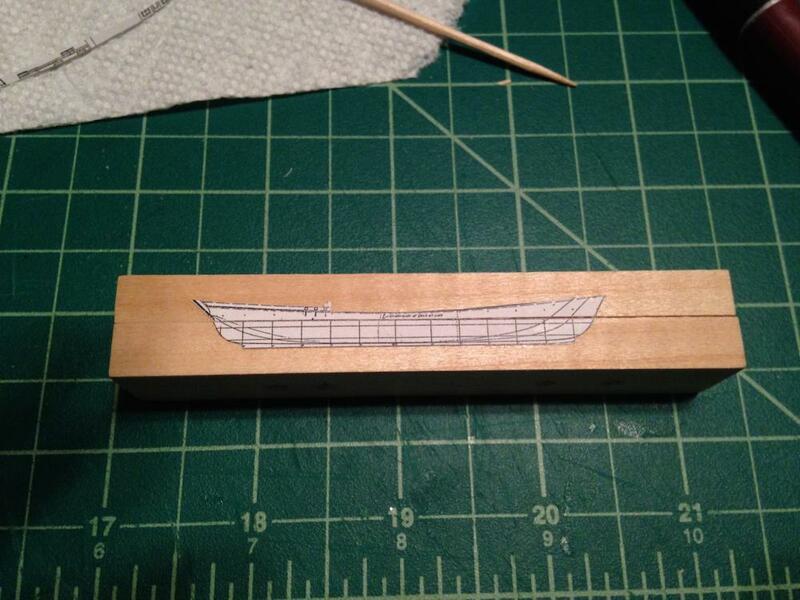 I need to touch it up a bit, and clean the ends at the stern, but am fairly happy with how things ended up. I like the idea of wood for this kind of detail. An alternative is paper - standard printer paper is .004 in/0.10 mm, archival tissue is half that and glassine is about half again thinner. I'm not suggesting you re-do this stripe, just something to keep in mind for use on another project or application. 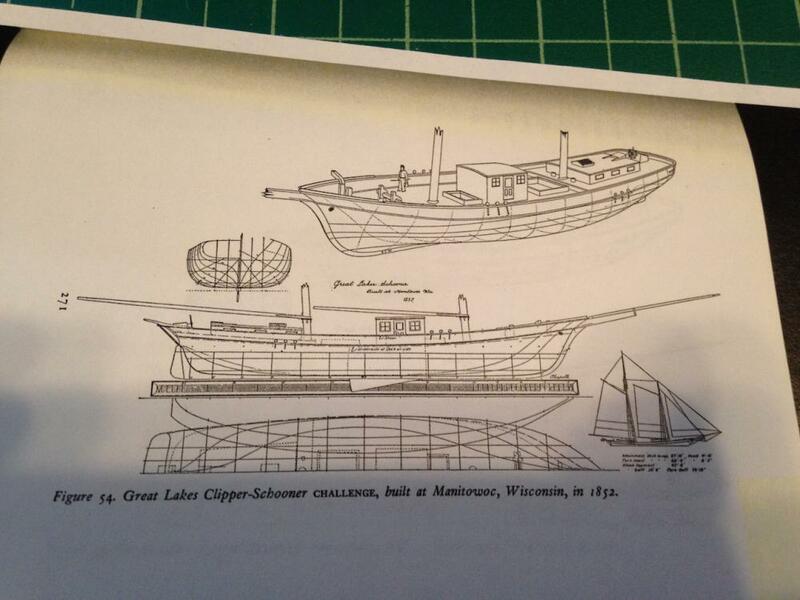 Edited to correct paper thickness. Thanks Dave, good to know. 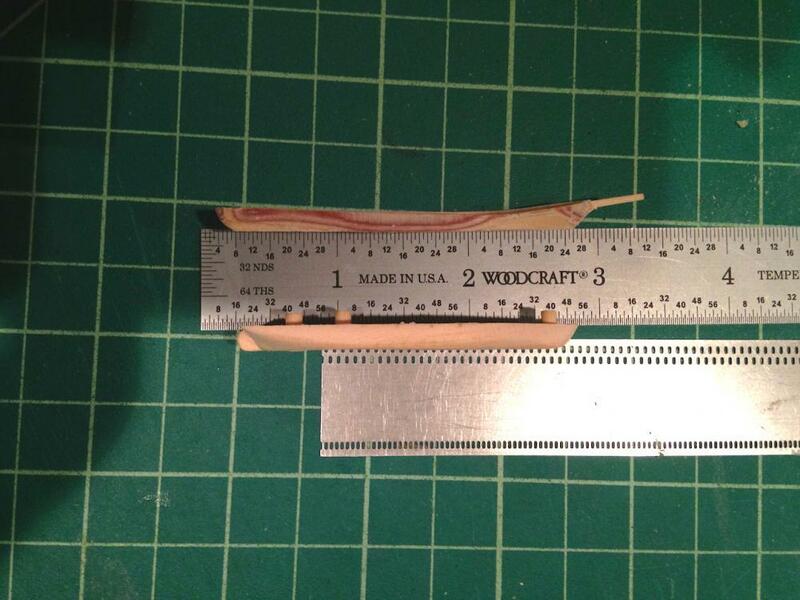 Just out of curiosity, does paper hold up long term in terms of structure and being glued down? 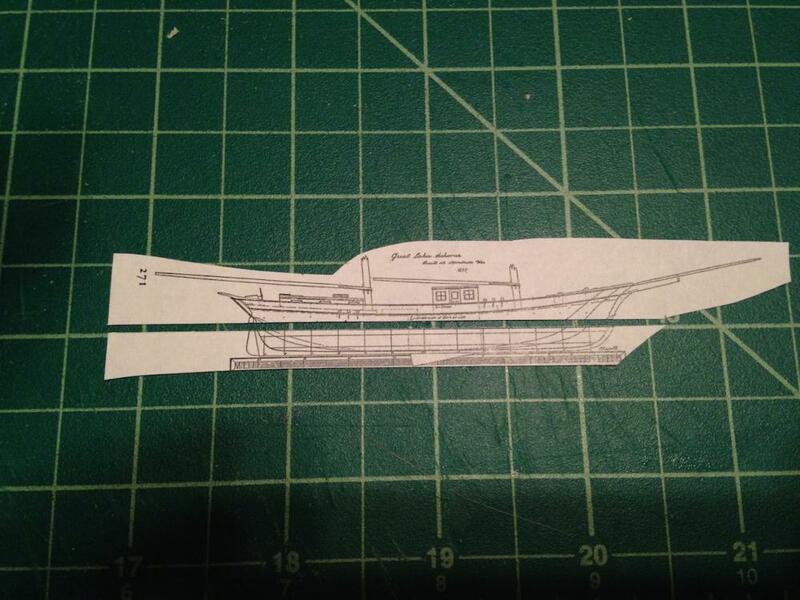 I've used black cartridge paper on my larger builds, but only in very small amounts. When I want a thin stripe to stick on, I sometimes use a length of old video tape! It is extremely thin. If the surface is roughened slightly with fine wire wool, you can spray it any colour you want. 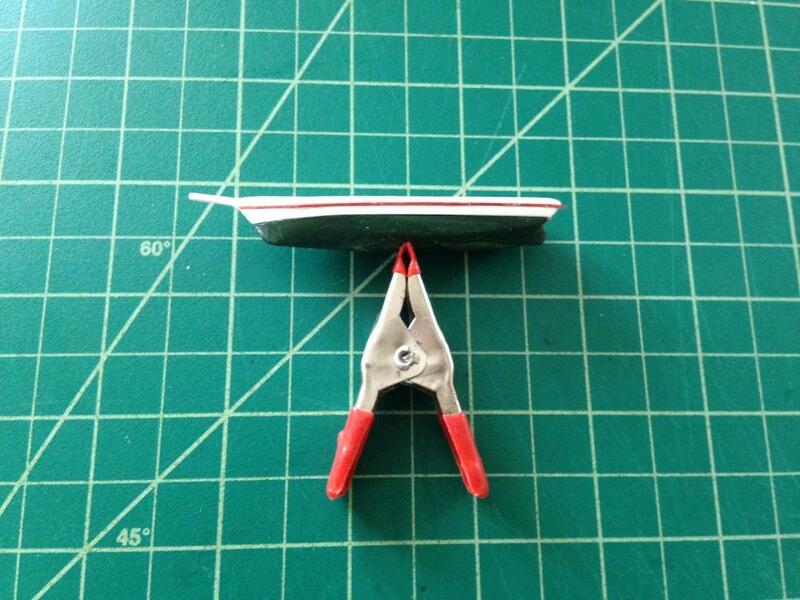 Tape it to a piece of scrap acrylic, and after painting, slice the strip off with a scalpel. I've not had problems, I use acid-free or pH neutral archival tissue, glassine or paper then seal it with a coat of artist's matte acrylic varnish. 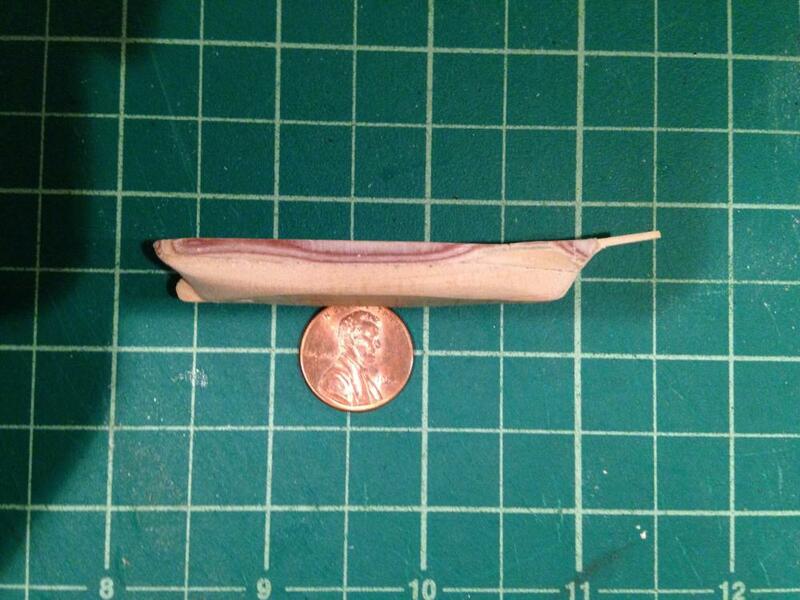 This is what I love about miniature building. All the various things items that can be incorporated into modeling. Next time I go home I'm grabbing a couple VHS's. One note on paper. I've used is a few times and I do think it holds up. One thing to watch though is the type of sea you use around the paper. If you use Plasticine like I do the oil may wick up into the paper and ruin it. If it's sealed well this won't be a problem. From the last line of your 1st post...does not look like you lack skill. Excellent modeling !!! Await the completion of your heirloom piece ! Thanks very much Jim, that means a lot coming from you. Really appreciate it. And a general thanks to everyone that has looked in on my log and answered my questions or otherwise commented. This board is a real godsend for newbies to the hobby like myself. Thank you all for your time and for sharing the benefits of your experience! Wow, it's been two years since I last posted. Between work, kids and working on my larger models, time has really flown. It took a few weeks, but I like the results. I set up a second blank to do two at once and have the option of just picking the best one and use the other for practice or trying out techniques (or bottling both), but the first one came out pretty nicely so I might just stick with it.